The image above is our latest video blog. Click on the image to watch the video on student assessment in Worthington Schools. At last night’s (9.28.15) Worthington Board of Education meeting we spent the entire meeting with the board discussing our 2015-2016 comprehensive student assessment system. Assessment is a major driver in education today and as a school district we believe in the power of assessing our students. Assessment is important but it always needs to be in balance with classroom teaching. There should be a significant amount of classroom teaching and as little assessment as possible to provide the necessary data. Last spring with all of the new State of Ohio assessments (PARCC and AIR) we felt like our assessment system was out of balance. There was too much assessment and not enough time for classroom teaching. The State of Ohio responded to this and reduced the time for state assessment this spring. In addition, as a school district we decided to take a step back and analyze all of the local assessments we choose to administer to our students. Worthington Chief Academic Officer, Jennifer Wene, partnered with the Educational Service Center of Central Ohio and new Worthington Director of Secondary Education, Neil Gupta, to work through a structured student assessment inventory. All local Worthington assessments were evaluated based on their purpose, what information is provided by the assessment, how teachers were using the assessment information, and what the student experience was like. Our goal was to make certain that every assessment we give is meaningful and the best use of a student and teacher’s time. After completing this process we made some adjustments to our assessment system. A few tests were changed in order to reduce overlap and in order to get more expedited actionable data. In a few areas we realized we needed to do a better job in helping our teachers and parents understand the assessment and we put plans in place for this year to make that happen. When you see this year’s assessment calendar you can be certain that a great deal of thought has been put into the calendar. If we’re giving an assessment we believe it is necessary so that we can help every child grow to their fullest potential. The presentation from last night, our assessment calendar and our monthly assessment newsletters are located on the Worthington Schools website. As we settle into the routines of the 2015-2016 school year, it is hard not to notice that something is different. Actually, there are lots of differences, including Worthington Academy, a website that is more dynamic and easier to navigate, 80+ new teachers and other staff, and 740 kindergartners! But something else is different, perhaps (to borrow from children’s author Ashley Spires) the “most magnificent thing” of all! If you have children in one of our elementary schools, they can probably tell you about the experiences of the girl and her “assistant” as they work to build the most magnificent thing. Our student achievement coaches have visited every classroom to share this story and talk with students and their teachers about growth mindset. 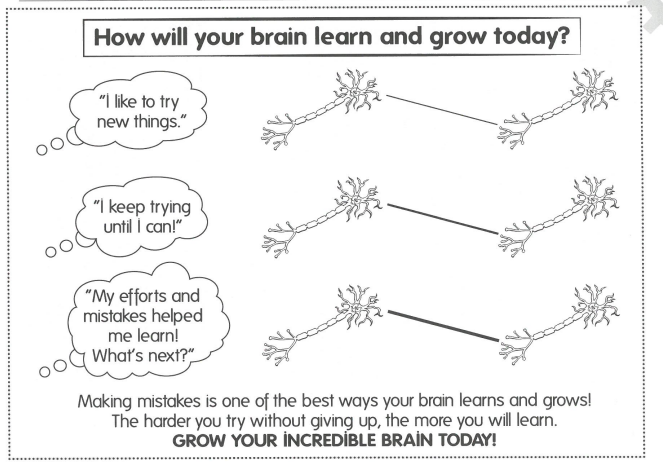 In Worthington, we are talking with students about how we “grow” our brains and with our entire staff about the importance of cultivating growth (as opposed to fixed) mindsets in ourselves and in our students. All certified staff members are working in Teacher-Based Teams in which they examine evidence of student learning in order to evaluate the impact of their instruction and adjust practices as needed. Our goal is for ALL students to experience our schools as places where they are challenged daily by caring professionals–where their abilities are developed. A few years ago I read the book “365 Thank You’s: The Year a Simple Act of Daily Gratitude Changed My Life” by John Kralik. In the book the author chooses to write one thank you note each day and he chronicles the way that over time this process changes his thinking. After reading the book I committed to trying to do a better job at writing notes myself (sometimes I’m better at it than other times) and I have come to really believe in the power of the hand-written note. As such, I was really excited when a mom in our school district showed me the note that her second grade daughter brought home from class. 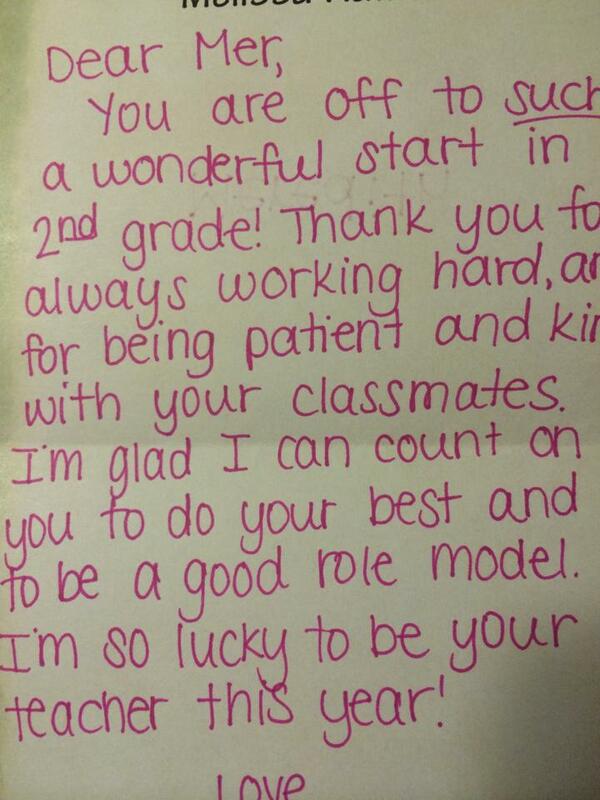 The teacher had taken the time to handwrite a short note of encouragement to her daughter. And, it made an incredible impression on the entire family. As a parent, when your child comes home excited and encouraged everything brightens. As a student when your teacher takes the time to tell you you’re off to a great start and that she’s excited to be your teacher, coming to school is a whole lot easier. As a teacher the investment in personal relationships will likely pay dividends all year long. I believe all humans appreciate a positive note. It doesn’t matter if you’re 70 years old or 8 years old. When someone takes the time to share some words from the heart in a handwritten fashion, it’s always positive. When our teachers take the time to work with their students in this fashion they demonstrate that they care and they model our first expectation of being kind to kids. 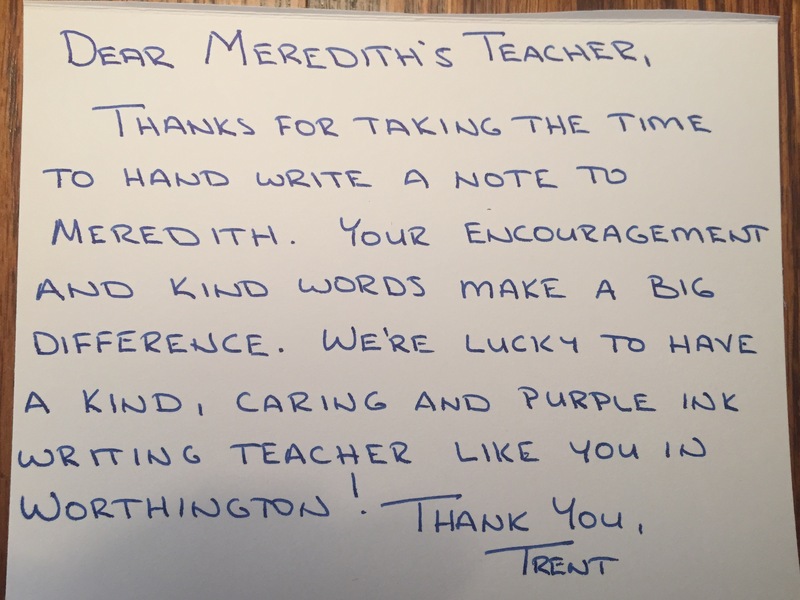 Now, we just need to make certain that all of our students, and especially Meredith’s sister, learn you’re never too big to receive a positive note of encouragement. When I was in ninth grade I was cut from the basketball team at Worthington High School. I was a 5’ 8” power forward who didn’t dribble, pass, or shoot, all that well and thus likely the coach made the right decision. Getting cut from a sport is hard, but it’s also a learning experience and hopefully it helps our students build the critical skills of grit and perseverance. Recently I learned of a Worthington student who turned athletic disappointment into a true success. If you drive around Worthington on a Saturday morning you will see thousands of boys and girls playing youth soccer. Many transition to travel teams and play tournaments throughout the state and even across the country. Unfortunately soccer is the ultimate funnel. By late high school that thousand athletes has turned into only 6 to 10 boys or girls per class that will make the high school teams. This year that held true and one of our junior girls who had played travel soccer for close to a decade didn’t make the varsity team. Most students would be bitterly disappointed. Some students and their parents would blame the coach or the evaluation process. Some might even threaten to sue the school district. Not this young lady. Instead, after being disappointed for a night, she decided to change sports. On her own she emailed the girls tennis coach and asked if she could try out for the tennis team. (She didn’t even own a tennis racket, there was no tennis racket in her home, and she had never played before!) The coach welcomed her to tryouts and her friend lent her a racket. She made the tennis team and she has even purchased her own tennis racket. She’s playing tennis and has great potential. 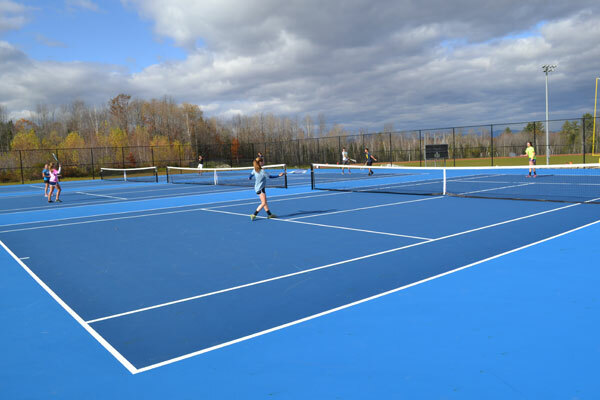 In Worthington we want our students connected to a co-curricular activity that is positive and builds community. We want them to strive for greatness, and when they fail, we want them to bounce back up and try again. This is just one example of that. With this young lady’s resolve and her positive attitude I imagine she will see great success in life. When one door closes, just open another one. That’s a great life lesson for all of us! Periodically we will post video blogs. Please check out the video above to watch our blog post. 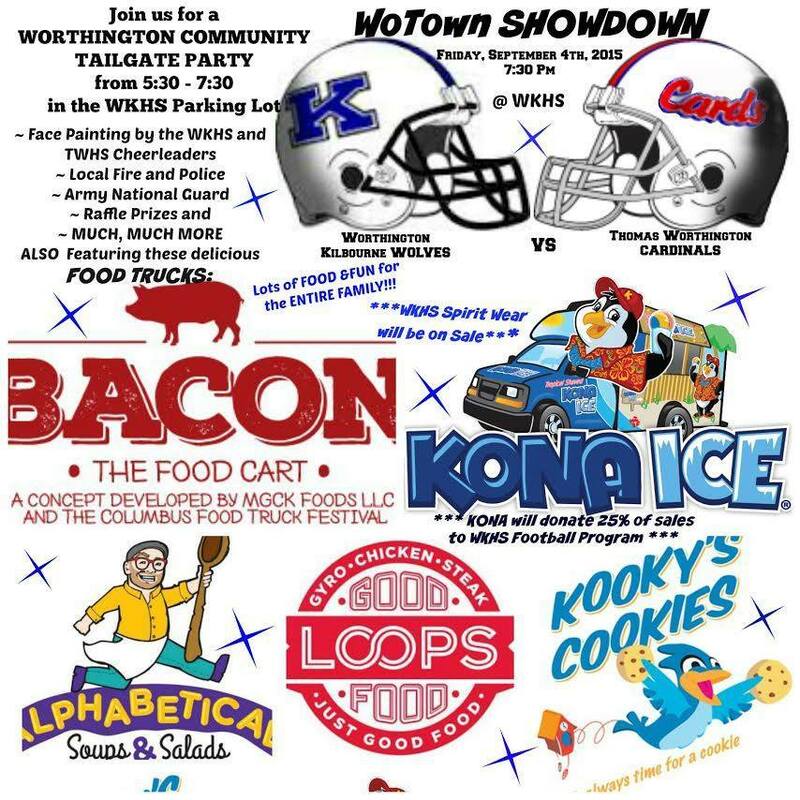 This week’s video blog is an invitation to connect with the Worthington community at tomorrow night’s (9.4.15) Worthington Kilbourne v. Thomas Worthington Football game at Worthington Kilbourne High School. Kick-off is at 7:30 P.M. but beginning at 5:30 P.M. there will be food trucks, face painting for kids, a raffle, etc… The evening will feature over 400 of our high school students who will compete on the football field, lead cheers, or perform in our outstanding marching bands. Please come out and support the Wolves and the Cardinals. It’s sure to be a great night to kick-off Labor Day weekend in our community. Go Worthington! 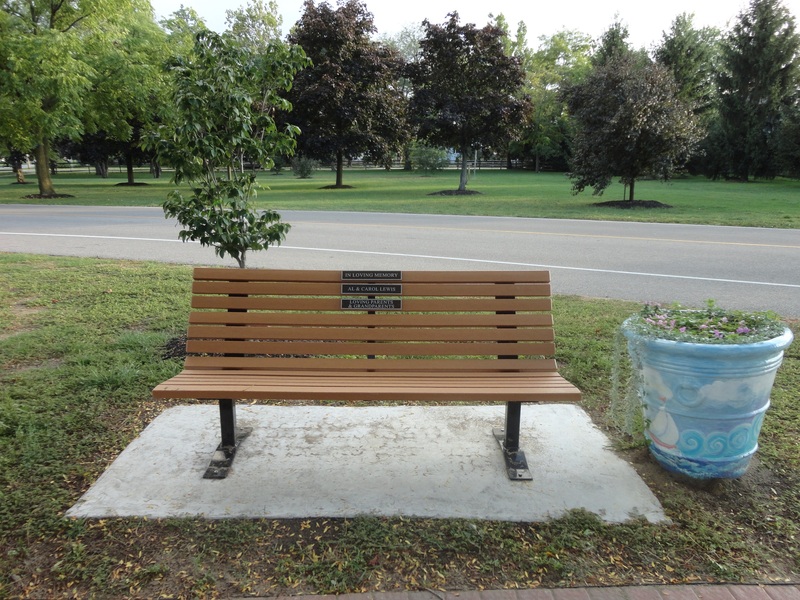 Recently on a visit to one of our secondary schools I encountered our school principal sitting outside of the school on a bench talking one on one with a student. When I pulled my truck into the school parking lot I realized that in order to enter the school I would need to walk directly in front of the principal and the student on the nearby sidewalk. From the moment I pulled up it was obvious that this was a fairly serious conversation. Our principal was sitting forward on the bench with his elbows close to his knees and as he talked he was gesturing with his hands. The student on the other hand was leaning back against the bench and from time to time he would put his hands on his head like he was fairly exasperated. As superintendent of schools it’s hard for me to go anywhere unnoticed these days and I was fearful that if I attempted to enter the building as planned I would interrupt this conversation. So, I decided to just stay put. I sat in my truck, answered some emails on my phone, and watched the conversation from a distance. Five minutes passed, then ten, then twenty, and I was still sitting in my truck. They were still talking! What I learned later was that the conversation I witnessed actually lasted for over an hour. The high school-aged student was just coming back to public school after spending a few months in a drug treatment program and he wasn’t sure school was going to be for him. Our principal on the other hand was certain that this student could and would be successful in our school if he would just give it a chance. I couldn’t have been prouder. Our Worthington Schools administrator invested over an hour just talking one on one with a student who needed to know someone believed in him. Our Worthington Schools administrator let emails, paperwork and other pressing issues wait in order to spend quality time with a young man who needed someone to spend quality time with him that day. Will the conversation make a positive difference? Only time will tell. But, it’s the sort of act that has the potential to help change the trajectory of a life.